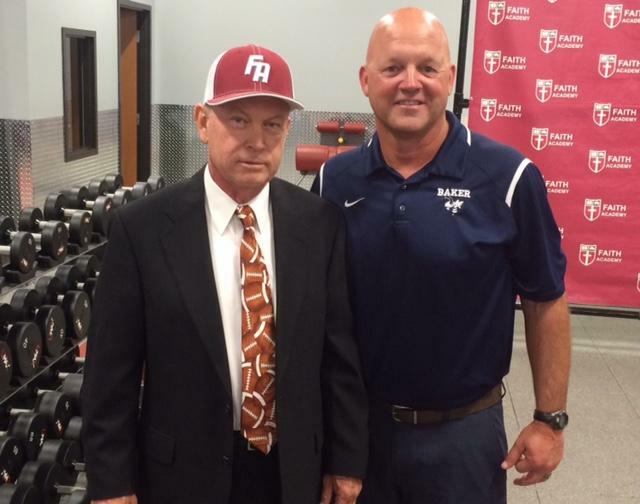 Former Baker coach Jack French was announced Tuesday as the new head football coach at Faith Academy. French retired from coaching three years ago and did not intend to return to the profession. He spent the last two years working as a field representative for Coaches Outreach, a ministry that organizes Bible studies for coaching staffs. French, 64, had coached for 40 years when he retired. He had come to Alabama from Mississippi, where he had won 258 games and 4 state championships. French coached at Baldwin County, Clarke County and Baker. His Baker teams went 27-15 with a pair of playoff appearances. He didn’t have a losing record in four years with the Hornets. Prior to his arrival, Baker had 21 straight losing seasons under seven different head coaches. French takes over a Faith Academy team that went 3-7 this past season under interim coach Jeff Estes, who took over for Lane Lawley last summer after Lawley resigned due to health reasons. Estes will stay on at Faith as assistant head coach, the school announced. Counting Estes, French is the sixth head coach in the team’s 10 years of AHSAA play.